"I can't remember how it entered my head," says Rachel. "But once it did, I just had to do it. I went to the library and got a bunch of books on chickens. I read all of them and devoured all the information I could. I got a chicken coop from a nice lady who sounded like Paula Deen, and my dad drew out a plan for a run. 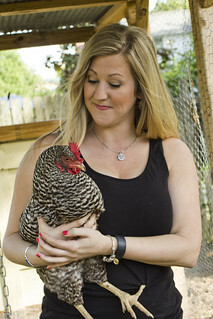 I'd never had chickens before, but I also never thought that I couldn't do this." Rachel diligently prepared her backyard for the arrival of a her new additions, and, with every detail in place, she brought her new babies home. "It's been about a year now, and I still find it addictive," she laughs. Rachel, who works as a Human Resource Generalist at Superior Care, trades her business attire for jeans and boots every afternoon. As she enters her yard, she is welcomed by the happy clucks of her burgeoning brood. And every day might as well be Easter as she hunts the yard for eggs. "They lay all over the place," she says, "but for the most part, they keep to the same spots." Rachel looks behind plywood leaning against the fence, under the edges of her storage building, and even in the potted plants. With each hen laying five to six times a week, eggs at the English home are plentiful, and Rachel gives many of them away. But Rachel isn't in it just for the eggs. She truly loves her babies, as she calls them. They all have names such as Clover, Blanche, Georgina, and Mimi Rose, who she named after watching an episode of the TV show Girls. "They all have personalities," she says, "and there are all these little dramas going on. They are family! "And I'm still learning. I had one that was all broody. She'd gather all the other girls' eggs and sit on them all day. I'd read that if you take a chicken and dip it in water that it would stop that, but it didn't work. But I did learn where the term 'madder than a wet hen' comes from! There's so much more I need to know. I do get kind of nerdy about it, and I sure do like to fuss over them!" Unlike Rachel, Dia Canter knows where her chicken journey started. "It was the granddaughters," she said. "Lily and Harper Grace wanted them, so I suggested to my husband Robert we start with three or four. He is a total pushover, however, and he came home with thirty! "We let them roam free around the property. We do have a coop and an enclosed area for our babies. They stay there for a while in order to learn where home is. The rest roam around and enjoy their freedom. We don't have any bugs around here, that's for sure. They eat everything they can find!" The Canter chicken clan is now up to ninety birds, but you wouldn't know it at first glance. When you take a look around Dia and Robert's property, you see a few chickens here and there, but with a closer look, you'll see them nestled under bushes, in the adjoining woods, and tucked among the nooks and crannies around various outbuildings. Dia visits the coop daily, collecting a basketful of eggs. Even with ninety chickens, she knows them all as individuals, each with their own unique personality. "I just watch them, sometimes. The roosters will herd their small groups of hens and keep them where they want them. They are all unique and fascinating. "I never thought chicken husbandry would be on my resume, but it is, and it has been a more enjoyable a journey than I thought." As Main Street Director and Downtown Development Specialist, Melinda spends her days as a city girl, working among the brick and mortar in the heart of our city. At home, she finds a soul-soothing contrast atop lush, rolling hills of green and the clucks and crows of her brood of chickens. "As a little girl, I dreamed of living on a farm," she says. "My husband grew up on a farm, and my parents did as well. I grew up in the city and never had that experience. So when we came here, we looked for a place with land." Once the couple found a suitable spot and settled in, Melinda's dream of having a functioning farm started taking shape. 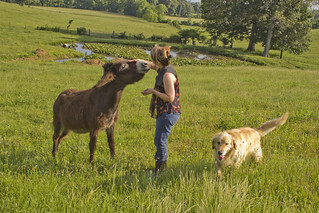 "It didn't start with the chickens," says Melinda, "but with a donkey. At three months old Jack came to live with us. It was a really appropriate start because donkeys are protective and watch over the farm. I had a rooster corner me one time in the coop, and Jack came barreling around to shoo it away and save me! He keeps an eye out and protects the other animals from coyotes." Within the first year, Melinda was raising some of her favorite breeds. "I love the Lavender Orpingtons (so named for their distinctive color) out of Pennsylvania, and we added some French Copper Marans and Ameraucanas. But I quickly found out the challenges chickens can face. We had some that seemed like they were getting colds. We did a lot of research with Murray State and the University of Indiana and discovered a bacteria was present." While the bacteria does not pose a threat to people, and such issues are common among broods, Melinda had her sights set higher than raising a few chickens in the backyard. "I wanted to expand," she says, "and sell hatchling eggs and chickens. I felt I had to be responsible and sell healthy birds." Melinda discovered that the bacteria would go away, but first, she had to depopulate. "The Kentucky Department of Agriculture helped us with that, and now we are repopulating." Melinda put a system of bio-security procedures in place to prevent future problems. Visitors must pass through a check point, and if a person could potentially bring in anything unwanted, entry is denied. Shoes are also changed as she moves in and out of various parts of the property. Just about anything, even finches, can bring bacteria to the farm, so her chickens do not roam. With these controls in place, Melinda hopes to be NPIP (National Poultry Improvement Plan) certified this summer. "That allows me to sell eggs at farmers markets or stores such as Troutt General Store," she says. While Melinda says that there has been a rise in the popularity of back-yard chickens and hobbyists who enjoy a more casual relationship with their birds, she has learned that in order to meet stringent standards required for Certification Statuses as a Small Poultry Breeder and to ensure a healthy flock for customers, that she must apply different standards..
"We raise our own meal worms," she adds, "and we have them in tubs as they progress through their different stages. They get good protein, and we feed them peas as well. They also love pastrami. They'll fight over that!" Even though raising chickens is becoming a side-business for Melinda, the biggest payoff comes from realizing her childhood dream. "I love it every single day," she says. "I come home from work, kick off my heels, and throw on some mud boots. It is my therapy."